Paul Laurent Landry celebrated his 102nd birthday on July 2. He was born in Nederland, Texas to Ejuste and Nellie Rageur Landry. He spent his early years living in Texas because his parents were working in the Spindle-Top oilfields of the Golden Triangle. At the age of four, his family returned to Louisiana and he spoke only English. This was not to his advantage in Vermilion Parish at the time, so he quickly learned to speak–and love–the Cajun French language. When he completed his schooling at Perry Jr. High, he went on to Abbeville High School, but those were hard times and he decided that his future was in the working world. So the ninth grade was as far as he went in school, but not as far as he got in life. As a young teenager he did odd jobs for farmers in the countryside. He hauled fence posts and firewood in this dad’s truck, worked in rice and cane fields and worked on any motors that need fixing. In 1933, the Civilian Conservation Corp (known as the CC camps) was established as part of President Roosevelt’s New Deal and Paul saw this as a chance to have a steady income and a purpose. He became part of the reforestation in the Bogolusa area. The government paid his family $30 a month for his services. He living in a tent and ate military rations. There were 12 men in his corps and they cleared fire lanes, dynamited tree stumps to make smoother roads, built walls and even a firetower. After two years, Paul returned home to work for the Acadia/Vermilion Rice Irrigation System (AVRI) manning the big pumps that provided water to the rice farmers on the Pumping Plant Road in Perry. In December 1935, at the height of the depression, he married Edola Margaret Perry, his classmate and neighbor, and together they made their home in Perry in the same house where he now resides. They raised three daughters: Judy Choate, who lives nearby; Paulette Landry, who resides in Fort Worth, Texas; and Connie Durand, a resident of St. Martinville. In October, 2013, his wife passed away at the age of 99 after 78 years of marriage. Landry, a “jack of all trades” could fix anything and became a mechanic for Wood Motors, the Ford dealership in Abbeville, which enabled him to earn money at something he loved to do. After 15 years in the automobile industry, he took a leap of faith and changed jobs. His next place of work was LASTARMCO, the local rice milling and drying company in town. He worked for the next 24 years drying rice and doing anything associated with the mill. He drove rice trucks to Arkansas and Mississippi and around the Louisiana rice-growing towns, then he moved on to maintaining the whole fleet of big trucks. He was known to his co-workers and employers alike as the “missing link.” He could be called upon to do whatever was needed. He traveled to and from California, Colorado and points west, moving the Godchax families to their winter homes and college dorms. In his time off, he even took part in branding cattle and shearing sheep on Live Oak Plantation. He continued to work for Riviana Foods when they merged Louisiana State Rice Milling with River Brand. In 1979, at the age of 65, he retired from the world of regular work. He was a part-time welder’s helper, and traveled to see his grandchildren and other relatives, and then he joined the Abbey Players. This began a long and exciting third career as an actor. He was no stranger to the stage, having taken part in minstrel shows and plays at the Perry school and doing benefits at Abbeville High School. He was cast in many varying roles and his appearance brought immediate response from the audiences–making him a favorite. He took part in 20 productions and was a regular bartender, and worked on set constructions, designing and building props. He spent many hours entertaining patrons in the lobby, and in 1985 he was honored with the coveted Bon Ami award for service above and beyond the call of duty. Landry then ventured into the world of film. He was chosen to play the part of “Sosthene” the saloon keeper in the beloved movie Belizaire the Cajun, where his French really came into good use. He went on to have active parts in The Gathering of Old Men, Shy People, and The Blob. He also did television commercials for Ruby Tuesday, The Gas Company, the Louisiana Lottery, Carwdad Bait, and Meche’s Drug Store, his best-know longest-running advertisement, where he sat on the porch of the original; drug store and spoke to a five-year old about the merits of dealing locally, in French of course. 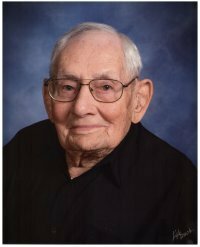 In the ten decades of his full and happy life, Landry has been witness to amazing progress, all the time cherishing his Cajun French heritage. He has seen efforts to educators to stamp out the beautiful language of his people, and more recently the resurgence of interest and popularity of all things Cajun–especially the food and the music. His favorite part-time hobby is listening to KBON radio station for news, weather and good music. He never misses the live radio broadcasts of Rendezvous des Cajun at the Liberty Theater in Eunice every Saturday night. He still follows his push mower in the yard, and enjoys sitting on the back porch receiving visitors and passing a good time. He is an inspiration to all who know and love him. His happy attitude and his Catholic faith hold him in good stead. He is truly a Living Legend and the oldest person to be inducted.